I had dinner tonight at Keystone in Clifton; not only are the Quesadillas amazing (and half-price on Tuesday) but the entire neighborhood is decked out for the holidays. There’s something about Clifton that warms my heart and its a lot to do with the College-Conservatory of Music at the University of Cincinnati. This is top musical theatre program features some of the finest young talent in the world and I am fortunate to have gotten close to many of the students there. This time of year is exceptionally fun as several of them are involved in various holiday concerts and events and I’d like to highlight a handful of them today. 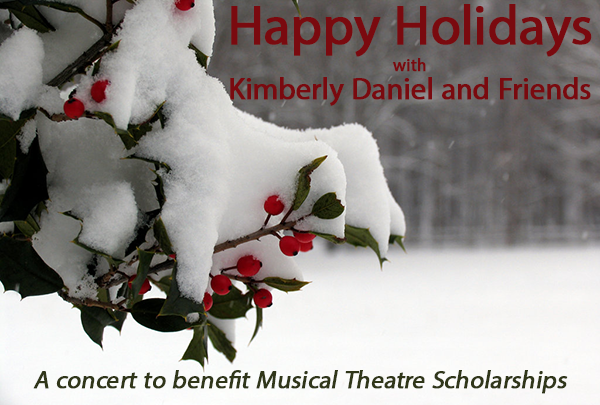 On Sunday, December 7th, Kimberly Daniel (a professor of voice) hosted a Christmas concert featuring students and faculty from Opera, Music, and Musical Theatre shared their talents with a sold out crowd at the Peterson Estate in Indian Hill. All proceeds went to CCM and the scholarship fund. Some of the highlights were Daniel’s opening medley, Ken Shaw’s rendition of the old spiritual “Sweet Little Jesus Boy,” Thomas Baresel’s comedic parody of the “12 Days of Christmas,” and DJ Plunkett and Lawson Young’s duet of “Baby, It’s Cold Outside.” I also very much enjoyed the piano stylings of Kenneth Griffith and Danny White, Ben Biggers’ holiday selections, clarinetist Jeffrey O’Flynn, cellist Carmine Miranda, and opera numbers from Paulina Villarreal and Pedro Arroyo Ojeda. Ojeda, specifically got a rousing response from the crowd. That same weekend, the students at CCM put on a fundraiser of their own for DWAVE (Deaf World Against Violence Everywhere). This show is the 2014 incarnation of CAROLS FOR A CAUSE, a tradition started by 2013 graduate Natalie Bounassar. This year instead of a cabaret, Ben Biggers and Tom Meglio wrote a Christmas musical, using traditional holiday songs with their original book as the backdrop. It was fun, highly entertaining, and well produced. Kudos to all who were involved and I was especially touched by the willingness of these students to give up their time to donate to such a worthy charity. You can learn more about DWAVE here. Here’s a wonderful clip of last year’s finale featuring Julian Decker and Eric Geil singing “O Holy Night.” (Jacob Yates is on piano). Finally, I capped off my CCM Holiday trifecta with a trip to the Covedale Theatre to see FOREVER PLAID: PLAID TIDINGS. This is one of the best musical reviews you’ll find featuring four of CCM’s finest male vocalists. 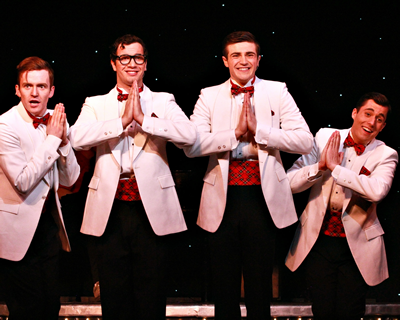 Tyler Huckster, John Battagliese, Charlie Meredith, and Thomas Knapp all shine in their roles as deceased singers back from the grave for the holiday show they never got to do while here on Earth. It’s funny, its full of cheer, and the harmonies are impeccable. Don’t forget CCM faculty members Steve Goers (musical director) and Patti James (choreographer), as their involvement only ups this show’s stock tremendously. FOREVER PLAID: PLAID TIDINGS runs through December 21st. It really is a lovely show. Tickets can be found here. So, there ya go… CCM sure knows how to get into the holiday spirit! And with MOVEABLE FEAST coming soon followed by THE HEIDI CHRONICLES and then PETER PAN . . . .well, let’s just say I’ll be spending even more time in Clifton soon and not just for the half-price Mac and Cheese at Keystone on Mondays. Kirk, You’re a good man! Thank you! I had a wonderful time! Thanks for the ticket and the hospitality!